Piaget Crenshaw is a Ferguson, Missouri, resident now – but she moved from Jennings about a month before the shooting of Michael Brown. Crenshaw told CNN's Michaela Pereira she witnessed the incident from her apartment and recorded video of the scene immediately following the shooting. "I had just moved there out of my parents home," she said. "To see something like this outside of my window ... it’s just, traumatizing." But police have given a different narrative, saying Brown struggled with the officer and reached for his weapon. On Monday, the preliminary results of an autopsy that Michael Brown's family requested was released, showing the teen was shot at least six times. In the video, you can hear Crenshaw's emotional response to what she had just seen. "God bless his soul," she said. "Police shot this boy outside my apartment." 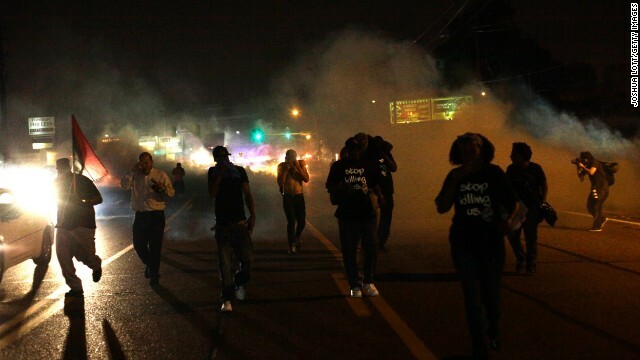 Tensions are still high in Ferguson, Missouri, after a police officer killed 18 -year-old Michael Brown. Michael Brown's family releases private autopsy results. A mob attacks a facility for Ebola patients in Liberia. And the U.S. joins the battle for Mosul Dam in Iraq.